#1. DeAndre Davis (6'8''-F-94, played in 2013-15, plays pro in Slovakia) led Iskra Svit to a victory against the seventh-ranked Handlova (11-19) 78-74 in the Slovakian SBL in Saturday night's game. He had a double-double by scoring 12 points and getting 15 rebounds. Davis also added 4 assists and 4 blocks in 37 minutes. 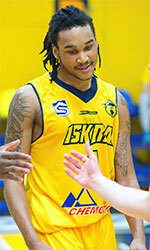 BK Iskra Svit (19-11) is placed third in the SBL. There are only two games left until the end of the Regular Season. So now every game will be critical. Davis has relatively good stats this year 12.1ppg, 7.5rpg, 1.6apg, 1.2bpg and 1.5spg in 30 games he played so far. #2. Chris Scarlett (6'0''-PG, graduated '15, plays in United Kingdom) managed to help Solent Kestrels to win against the tenth-ranked Dragons (9-13) crushing them 80-55 in the British NBL D1 (second division) last Saturday. Scarlett recorded only 2 points. Solent Kestrels (18-4) is placed second in the NBL D1. It was his team's fifth consecutive victory in a row. They will play only one more game in the Regular Season. And now that game is very crucial. This season Scarlett averages 7.1ppg, 1.6rpg and 1.1apg.